Once you no longer insist on eating spanish food in Spain - yes.please. Exploring the world, eating, drinking, enjoying art and little peculiars. Participate in the journey. Sometime we still pretend that we love local food and that when we go to Spain we should have tapas. 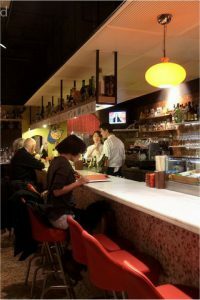 And the thing is that the best tapasbar might not be in Spain, but in New York (Read our guide here) or in Copenhagen (Read more about TORO istedgade here). So when we go to Barcelona, wouldn’t it be ok to eat japaness food. The Michelin Guide seem to think so. The restaurant is located just next to the museum of modern art. 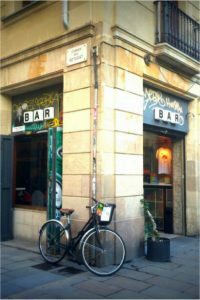 Here you pass by the skaters and wander in to the narrow streets of Raval. On a corner covered in graffiti tree neon letter spelling out B A R is blinking and you would have no idea what’s going on here if it wasn’t for the bottom corner of the window being splattered with Michelin recommendations. Dos Palillos is such an intriguing travel destination. 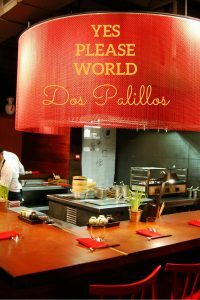 Opened in 2008 by a former ElBulli chef, the experience at Dos Palillos is layers upon layers. After first of all finding the place, you is first greeted in a location that looks exactly like a classic spanish tapasbar. From here you enter through the curtains and find yourself in the back alleys of Osaka in Japan or in Shanghai, with great big red lamps hanging from the ceiling and a big open kitchen with the sizzling of stirfry. Reach out. Send us an mail using hello@yespleaseworld.com.